When I was last on Catholic Answers Live last week Constantine Regas called in to defend the Eastern Orthodox position against the Catholic Church’s teaching on Peter and the Primacy of Rome. Constantine’s words are in BLUE and my responses are in BLACK. I appreciated Constantine’s irenic tone and honest demeanor. CONSTANTINE REGAS (CR): I called the “Catholic Answers Live” show last Monday to clarify the Orthodox position on authority in the Church. STEVE RAY (SR): I remember Constantine. And the studio cut us off before we got very far in our conversation. 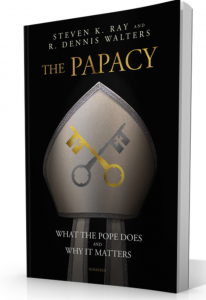 CR: My exact question was that, if Christ gave St Peter the Keys to the Kingdom, why isn’t the current Bishop of Antioch the head of the universal Church since St Peter was the founding bishop of that city several years before he became the bishop of Rome? Part of your response was that he was also the first bishop of Jerusalem. The Apostle James was Jerusalem’s first bishop. SR: Jesus promised him the keys to Peter in Matthew 16:19. The Royal Steward steps up to his position of authority when appointed, especially to fill in for the King in his absence. Once Jesus ascended into heaven and the Holy Spirit fell Peter picked up those keys and exercised his authority on the day of Pentecost. From that point on we hear no words of the other Eleven. Except for Paul, none of the others have any recorded words in Acts. Peter is the Bishop, the Pope and the visible Head of the Church from that point. In his massive history of the Church, Warren Carroll gives a very cogent outline of Peter’s movements. You can read this list here as I provided in my book Upon this Rock. You say that the Apostle James was the first bishop of Jerusalem. If you referring to James the son of Zebedee, you are incorrect because he was killed by the sword about 42 AD as recorded in Acts 12:2. The James that became bishop of Jerusalem was James “the Lord’s brother” (Gal 1:19). He was referred to as James the Righteous. He became bishop of Jerusalem after Peter’s departure for Antioch around 40-41. Peter was the leader of Jerusalem for 10 years before going to Antioch for 2 years then ending up as the leader of the Church in Rome about 42 AD. CR: The point I was making is that primacy of honor (not authority which rests with Christ alone) was given to the bishop of Rome because it was capital of the empire. SR: Unfortunately, you are incorrect again. Never was the phrase “primacy of honor” used until after the Eastern churches broke away from Rome, took a new name (Orthodox) and used this phrase as a justification for rejecting the honorary and jurisdictional authority of Rome. One only needs to read history to find the Eastern churches in heresy for much of their existence and always depending on Rome to establish the truth of the faith and to appoint orthodox bishops in Eastern churches. Rome was established as the See of Peter because Peter chose it to be. Jerusalem had become a backwater city after the destruction of Jerusalem by Titus and the 10th Legion. Yes, Rome was the capital of the Empire and the hub of the wheel (“all roads lead to Rome”). Peter and Paul established the Church of Rome by their blood and it was by their appointment, the See of Peter and the Head of the Church. Of course, Jesus is the head of the Church. But he left his royal steward with the keys of the kingdom as a visible head of the Church and a source of unity. There is no contradiction here. CR: The second canon of the Second Ecumenical Council A.D. 381 explains this clearly. After the capital was moved to Constantinople, primacy of honor became shared. Feel free to investigate. SR: I see you do not provide the quote from the source you cite. It is easy to say a council said this or that, but proving it is quite another thing. And claiming the primacy was “shared” is an eastern idea and refuted by the facts of the first 1000 years of the Church. This I have made abundantly clear in my book Upon this Rock. Ancient Epitome of Canon III: The bishop of Constantinople is to be honoured next after the bishop of Rome. CR: I also noticed that the above comment (among others) was edited out of yesterday’s rebroadcast. SR: I am not aware of that, nor is that under my care. The sound techs at Catholic Answers Live handle what is posted in the podcast. CR: One last point if I may: All the Eastern bishops can trace their authority back to one of the Apostles. The Vatican recognizes this and therefore acknowledges the validity of the Orthodox priesthood and sacraments. SR: We have no argument here. That is why we consider the eastern churches to be legitimate churches. We don’t consider Protestants to be churches since they have lost the apostolic succession, which the Eastern Orthodox churches have maintained. However, that has nothing to do with the fact that Rome has the primacy both in honor and in jurisdiction. The Eastern churches are in schism and we all hope that one day there will again be unity. St. Pope John Paul II said it best when he stated his desire that the Western and Eastern lungs be breathing together again in one united Body of Christ. If you are interested in my thorough study on all of these matters, in which I interact a great deal with Orthodox theologians, I suggest you get my book referenced below. I appreciate your irenic tone and honest discussion. God bless you my brother in Christ!